The first ever RORC Round Britain and Ireland started in 1976. Since then there have only been seven editions of this race and The Round Britain and Ireland Race is considered one of the toughest and most challenging races around. The race starts and finishes in Cowes on the Isle of Wight and covers 1802NM of the entire British Isles non-stop with competitors taking on the course in a clockwise direction. The race is seen as one of the most demanding races and has often been suggested that it is tougher than an Atlantic crossing because of its similar course length and will take competitors around some of the busiest and most tactically challenging sailing waters in the world. Crews will face the challenges of ever changing tides and unpredictable weather; dodging oilrigs and container ships and constant sail changing as the course alters at each major headland. The race takes up to 11 days to complete with a few competitors striving to break the record which is currently held by 70- footer Groupama 7 who, in 2010 managed to complete the course in a remarkable 5 days and 21 hours breaking the previous record set by Dee Caffari on Aviva by over half a day. 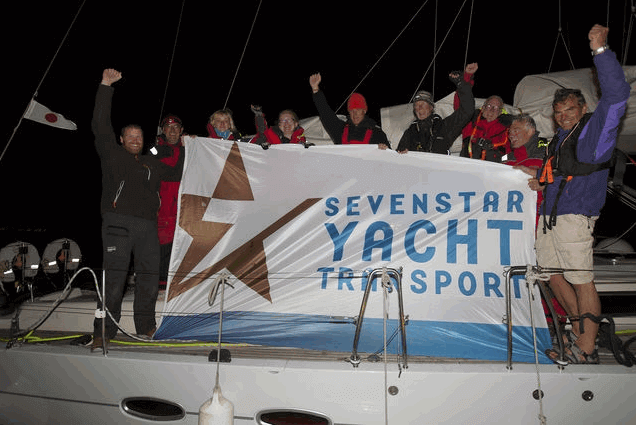 Sevenstar sponsored the race in 2006 and 2010 when 30 yachts from nine different nations competed in the exhilarating and world record breaking event. In 2014 Sevenstar have once again committed to sponsor the RORC Round Britain & Ireland Race 2014 and have offered a new prize incentive for the first boat to cross the finish line under IRC rating: a US$20,000 voucher for yacht transport to their selected destination in the world. The race attracts an incredibly diverse fleet including multihull, IMOCA Open 60 and Class40, and in 2014 will see a number of Volvo Ocean Race Teams in the new one design VO65 fleet compete as a warm up to the Volvo Ocean Race which will start 2 months after the Round Britain and Ireland Race. This will give them a chance to race against each other for the first time. This race is open to novices who are able to buy a space on a designated charter boat and compete in qualifying races. For some of us, the basic challenges of day to day life are simply not enough – I guess some of us need to push ourselves that little bit harder than others in search of a thrill. The general term for such people is adrenaline junkies, yet in the world of yachting, there is another label for them – competitors in the Round Britain and Ireland Race. This is an event so challenging that the organisers only dare to hold it every four years for goodness sake! 2014 is one of those years, so now is your chance to step up and see how you measure up against some of the toughest and most talented sailors in the world taking on one of the trickiest and most testing courses in the world. The route is 1,802 nautical miles long and takes you clockwise around the British Isles non-stop. We all know the kind of weather Britain can dish up at any time of the year; fair to say it is generally a mixed bag. Expect everything from glorious sunshine to torrential rain, from big winds to flat calms it will all be there in some measure as you race around a coastline almost as varied as the weather itself. There is everything here from the verdant rugged beauty of Ireland’s lonely west coast, to the magnificence of Muckle Flugga off the Shetland Isles, the top mark of the course. Indeed, the list of waypoints and marks around the course flows off the tongue like some kind of sailor’s paean to our beautiful coastline. Bishop Rock, Muckle Flugga, Sula Sgeir, the list goes on like pure poetry. This is more than just a race, it’s a trip through the annals of Britain’s proud nautical history. But what a race it is! A blast around the course will take up to 11 days to complete. Most taking part will be happy to complete the challenge, but some will be out to smash the existing record which stands at a quite staggering 5 days and 21 hours. This record was set by the mighty 70- footer Groupama 7 in the 2010 race and an indication of the kind of speed achieved can be witnessed by the fact that the hard pushed yacht averaged over 12 knots for the entire race. That is really going some and the French vessel has undoubtedly set the bar very high, yet there will be plenty out there eager to better this time and given the quality of yachts entering and the steely determination and skill of those manning them, who’s to say records won’t tumble this year? Truly this is a unique event. Bear in mind that there have only been seven editions of this race since its inception in 1976 and only four of those have been non-stop and you get a good idea of how unusual an event this is and also how important it is to grab the opportunity to be part of the action.